Though streets can become dangerously slick any time it rains or snows, too many people don't take the conditions seriously and drive way too fast on the road.One driver's rear camera captured the tragic consequences of what can happen on rain-soaked roads. On a motorway in Seoul this month, a bus driver tried to slow down but lost control after two cars crashed into each other. 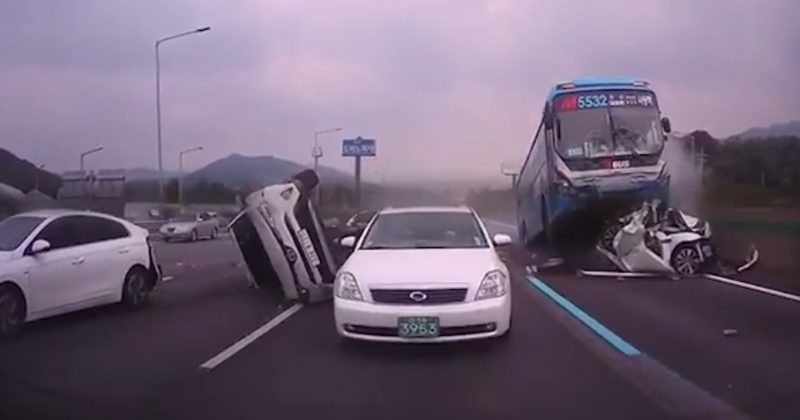 The horrific footage shows the bus plowing through traffic, crushing one vehicle into a twisted ball of metal.Two people were killed and 16 were injured in the fatal crash. Police believe it was caused by careless driving.